Soundproof Cow has soundproofing materials that provide the perfect noise reduction solution for any space or piece of equipment. We offer a variety of soundproofing products and sound isolation systems from top brands like Quiet Batt™, in addition tosoundproof barriers and sound dampening and deadening materials. With our soundproofing materials, you can easily stop noise transfer, add privacy to any room and keep the noise contained. For example, if you want to soundproof a door or piece of equipment, we recommend purchasing door seals and sweeps, or vibration isolation mounts. It’s soundproofing materials like these that will keep you sound-free. How Do Soundproofing Materials Work? To understand how soundproofing works, you first need to know how sound waves work. When an object vibrates, it sets the air around it in motion. So, when a stereo makes a sound, it pushes the air onward, and you hear it when it reaches your eardrum and causes your eardrum to vibrate. All sound must eventually be absorbed by something. When sound is absorbed, it turns into heat energy. Sound-absorbing materials absorb sound waves and make them disappear faster. When an object, like a wall, reflects sound, it causes an echo. This is because sound can bounce off of hard surfaces rather than sink into an absorbent material. Soundproofing materials, on the other hand, help prevent the transmission of sound between rooms by blocking sound. The sound transmission class (STC) is used to measure the ability of a material to block sound, whereas the noise reduction coefficient(NRC) measures the average of absorption at certain frequencies. Generally, materials with greater mass block sound better than lighter materials. Because sound can travel around barriers, sound blocking involves filling cracks, holes or gaps where sound can escape or adding mass. Soundproofing materials, in general, work to control noise by preventing it from entering or exiting a room. Different materials have different effects on sound. Your soundproofing needs will depend on your goals. For example, if you’re a guitar player who likes to rock out in the middle of the night, you’ll want to focus on keeping sound in, and you’ll also want to improve the acoustics in the room. If you are the neighbor of a guitar player, you’ll want to keep sound from entering your bedroom while you try to sleep. Let’s look at the features, benefits and uses of the soundproofing materials we offer at Soundproof Cow to help you find the best solution for your noise-reduction needs. Dampening and deadening materials are often used in situations where extreme temperatures or limited space is an issue. Sound deadening materials work by reducing vibrations to make a space quieter. They are commonly used to stop rattling in carsfor a quiet ride with improved stereo sound. Sound deadening materials also help reduce distracting noise exposure in construction. You might install a sound dampening material inside an engine compartment to decrease the noise for heavy equipment operators. One study from 2016 confirmed that the use of sound dampening mats substantially reduced the engine noise reaching the operator. It proved to be an easy-to-install and affordable solution to a common problem. Silent Running SR-500: Silent Running SR-500 is a high-performance coating designed to eliminate unwanted noise and vibrations. You can apply this coating easily to wood, fiberglass, metal and most plastic surfaces. It is not affected by extreme temperatures, so you can expect durability no matter what the weather is. This coating is also nonflammable, waterproof and will not chip or crack. RoadBlockR™: Want to enjoy your music while you drive and not feel like you’re cruising in an empty aluminum can? Install RoadBlockR which is perfect for reducing automotive noises and creating a quality ride. 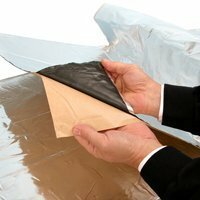 RoadBlockR comes in attractive foil-facing sheets that are easy to peel and stick in tight spaces. Vibra Block®: Available in a sheet, pad or strip, Vibra Block is a premium industrial-grade material to used to dampen vibration on steel panels. Engineered for maximum performance with an easy peel-and-place application, Vibra Block is a lightweight solution to stop rattling. They are composed of durable materials. They offer a cost-effective soundproofing method. They create a finished look. They improve audio quality within a space for a luxury ride. Put the finishing touches on any total-room soundproofing transformation with a door seal or sweep to block the noise completely. Our Quiet Door™ line shrinks the amount of sound escaping from around and under a door to the absolute minimum. Quiet Door perimeter seal: A perimeter seal forms a tight fit around the perimeter of a new or existing door. 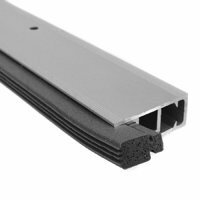 Made of heavy-duty aluminum framing and silicone, these seals can be adjusted or trimmed to fit your needs. Our adjustable perimeter seal allows you to make it like new with a couple turns of a screwdriver once it starts to wear. Quiet Door sweep: Our door sweeps push down firmly against the threshold of a door. Our sweep is built to treat standard doors that are between 28 inches and 36 inches wide. However, you can trim the material to fit any sized door. Or, if your door is much wider, give us a shout, and we’ll construct a custom door sweep for you. Our automatic door sweep pushes tightly against the threshold as the door closes. We also offer Quiet Door soundproofing kits which include soundproofing composite, perimeter seals, door sweeps and sound sealant for protection against noise. 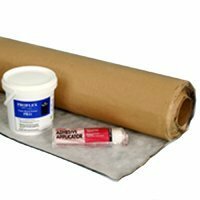 PROFLEX™ 90: PROFLEX 90 is a self-bonding sound-reduction membrane specially engineered for use under tile, stone and hardwood floors. You can easily peel-and-stick this material to help quiet your dancing feet for neighbors down below. Impact Barrier QT soundproof underlayment: Made of environmentally-friendly materials, this underlayment works with just about any type of flooring. It’s designed to provide the highest impact insulation class (IIC) rating improvement, with results proven by over 200 independent laboratory and field tests. It easily surpasses cork, felt, plastics and roofing membranes when it comes to soundproofing, and it’s available in a variety of sizes. It’s a great way to soundproof the floor. It makes cold floors warmer. It protects against mold and mildew. It helps reduce both impact and airborne noise. Acoustical sound sealant: Acoustical sound sealants keep unwanted sounds from escaping through cracks, and they help block external noises. A soundproofing sealant provides a simple solution to spaces surrounding walls, doors and windows. You can apply the sealant to a wide range of materials such as metal, concrete, wood, drywall and studs. This latex-based nonflammable sealant can also be applied to unexposed and exposed ceiling and floor runners, around electrical outlets and more. Best of all, it won’t crack, harden or separate. Soundproof primer: Ready to build a long-lasting soundproof floor? You can prepare a floor substrate for the application of a composite underlayment using a soundproof primer to ensure a strong bond between the subfloor and the underlayment. Our PR 11 water-based primer is easy to install indoor or outdoors. Soundproofing adhesive: A soundproofing adhesive allows you to permanently adhere sound absorption material to wood, metal, drywall, concrete, bricks and other surfaces. Choose our PL® Premium Polyurethane Construction Adhesive in a 10.2-ounce tube or a case of 12. Soundproofing tape: Soundproofing tape is perfect for achieving a smooth, finished appearance when installing soundproofing materials. Our Reinforced Aluminum Seam Tape is specially designed to seal seams between aluminum or polyester soundproofing products. The Quiet Barrier™ Tape is perfect for sealing seams between sheets of Quiet Barrier. You can also use soundproofing tape to seal tears or cracks in soundproofing material. 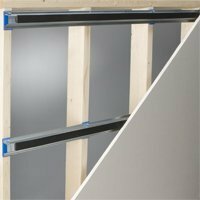 Acoustical mounts: Acoustical mounts hold soundproof insulation products in place and are easy to install. Quiet Batt Insulation Supports make it simple and fast to secure soundproofing products like Quiet Batt Soundproofing Insulation. All you need to do is push the insulation supports in place between the studs and the floor joists to keep insulation secure. We also offer hanger pins made of galvanized steel for a temporary and extremely easy, flexible solution to installing soundproofing materials. Significantly reduce the noise level in any location with a sound isolation system. The best soundproofing material for chapels, funeral homes, bedrooms, classrooms and more, these kits provide you with many tools for isolating noise and vibration before it’s noticeable. We’ll cow-culate the best kit for your needs using our free acoustic analysis and will work directly with your contractor or architect to get the best option for your property. IsoTrax™ Sound Isolation System: Our isoTrax soundproofing system is one of the simplest methods for installing sound deadening materials inside a wall or ceiling. This is the best soundproofing system we have, and it’s ideal for rooms that need maximum peace like bedrooms, nurseries or study rooms. Each kit covers 64 square feet and includes sound isolation rails, sound deadening pads, hex head screws and viscoelastic washers. IsoTrax Soundproofing System Ceiling Package: For superior ceiling soundproofing, the isoTrax ceiling package does not disappoint. This package includes more pads and hex screws than the standard package to make sure you have what you need to silence ceiling noise. Otherwise, the ceiling package is identical to the standard sound isolation system and delivers the same versatility and outstanding noise reduction. You may find a soundproofing barrier is essential to keeping the peace around your property. From blocking out airport noise to minimizing hum from your air conditioner, we have large and small noise-reducing materials capable of handling all types and sizes of annoyance. Fiberglass composite: Our fiberglass composite combines a fiberglass blanket with Quiet Barrier™ high-performance soundproofing material and a reinforced polyester film facing. Only 1-inch thick, these panels are easy to use just about anywhere you need to reduce noise. For example, you can adhere them to noisy machinery or hang panels on the wall using one of our soundproofing installation products. 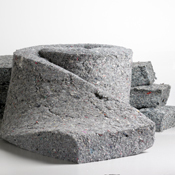 Fiberglass composite is a highly flexible, powerful soundproofing solution. Foam composite: Our foam composite soundproof barriers contain at least one layer of Quiet Barrier soundproofing material and one layer of acoustic-grade polyurethane foam. The Quiet Barrier layer works to block sound while the foam separates the barrier from the wall to prevent impact noise. The result is optimum sound control. We offer a range of foam composite products from a wrap you can use to soundproof pipes to easy peel-and-stick panels. Temporary barrier: If you need a temporary noise control solution, a temporary barrier may be the answer you’re looking for. Temporary barriers are acoustic quilts you can simply hang or lay down wherever you need soundproofing. Made of fiberglass and a nonporous vinyl covering, you can use temporary barriers as a sound-blocking curtain or to cover loud equipment. It’s a cost-effective way to solve noise issues in all kinds of situations. Mass loaded vinyl (MLV) barrier: MLV barriers are composed of salts, sands and metal particles to give them highly effective noise-reduction power. MLV barriers add mass to an area to block sound waves from penetrating through walls and ceilings. It’s a popular way to soundproof music studios. 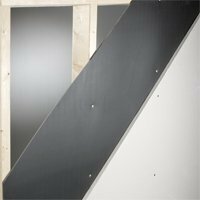 MLV barriers are safe to use and easy to apply between drywall layers or other building materials. We have individual vibration-reducing mounts and appliance feet for purchase to manage particular problems in any location. The perfect professional or DIY soundproofing material, the mounts are easy to install and offer immediate relief. Silence a noisy washing machine or prevent rattling from the TV with a quick and simple installation any installer can manage. Our VibeAway™ pads easily slide under a vibrating machine and are specifically designed to quiet noisy washers and dryers. However, they are available in a range of shapes and sizes so you can use them anytime you to need to silence furniture feet or loud appliances. It’s an affordable way to reduce noise and may eliminate the need for other soundproofing materials. Our VibeAway pads also help extend machinery lifespan by minimizing movement and banging. Soundproofing materials keep noise from escaping, and they block noise from entering. Noise reduction has many benefits for everyone it affects. For example, soundproofing materials provide a quiet space for learning. Whether you’re in an office, library or classroom, noise affects how you focus and learn. One study found that students in a standard or noisy environment did not learn as well as students in a quiet school. What type of product do I need: If you wish to keep noise from entering, you want a soundproofing material that blocks noise and keeps it from traveling through the walls, doors, and ceilings. Any items mentioned in this post are designed to block sound. If you are interested in reducing echo and improving the sound quality of a space, a sound absorbing material is the way to go. Where or what am I trying to soundproof: Consider what you are trying to soundproof as this will affect your decision. For example, if you need to quiet noisy pipes, you’ll want a flexible material that you can trim and wrap around pipes. If you’re trying to block sound from slipping under the door, you’ll need to seal up gaps where sound can escape. While our name is unique, that’s not the reason our products are often recommended by building pros. We carry some of the top-performing acoustical and noise-reducing materials in the industry. Despite this, we keep our products reasonably priced. 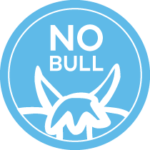 Keep an eye out for our ultra-low No Bull pricing as you browse our selection. Customers also trust our business, as we offer a 100% customer satisfaction guarantee, and we stand behind it whenever there’s a problem. Contact us immediately, and we will work diligently to ensure all issues are corrected. To avoid problematic situations with your noise reduction materials, we offer a free acoustic analysis to everyone. This will help identify the best products for your project. Our selection is constantly changing, so get in touch to discover the latest solutions available. Ready to get started on your new ultra-quiet home or office? Get in touch today online or call 1-866-949-9269.